It settles high risk disputes of either of descendent village (which could become a danger to existence and brotherhood of village) on call. Recent example was seen during the Jat reservation movement held between 19th February to 12th March 2012, where Khaps were called to mediate between movement’s activists and Haryana government. Khaps put the concern to problems arising to other society people due to unexpectedly becoming longer agitation. Though initially they also faced oppose from already infuriated community but finally settled the matter. It ensures justice for the victims of traditions and vices of society like dowry, unwanted money power use, discrimination against women etc. 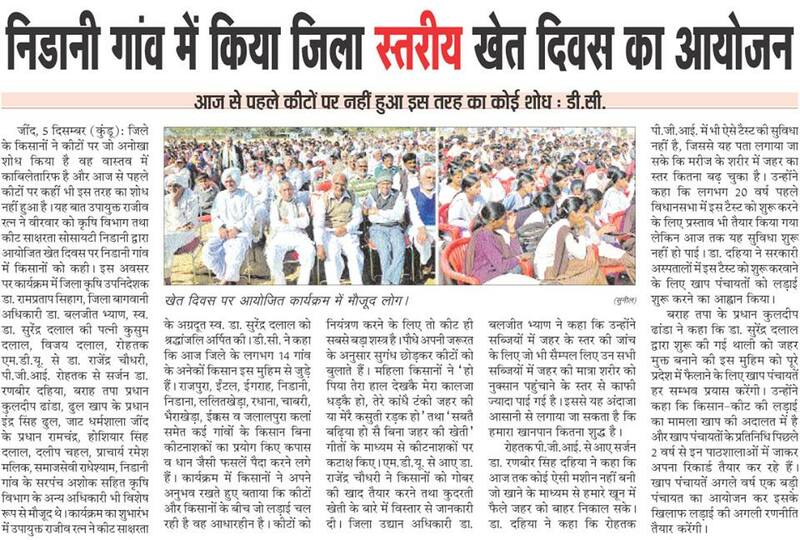 Khap leads and motivate its people to abstain from unnecessary show off during marriage ceremonies, Mrityu Bhoj (Kaaj) etc. even dictates its people to abstain from such social evils. It promotes events and investments by which social unison and welfare gets benefitted. ब्य्शेष: The measurements written above refer to the village major beliefs practiced in real and are mentioned here just to present the village cultural beliefs and norms. So it is suggested that if one decides for love marriage or loving someone by staying out of marriage then please decide so in consultation with your family, and could be affective relatives. Please don’t make this article or website a reference for any such purpose. ऑनर-किलिंग का कस्सया: The decisions of killing or exiling loving couples are driven under the greed of personal benefits or revenges and are believed personal to families or associated family groups. For example: If you are five sibling brothers and you are father of girls only or one or two sons; overall making it weaker in muscle power, then your brothers would intend to take-over your property and land (such are countable cases otherwise sibling brotherhood is the backbone of social system). And if tomorrow either your son or daughter wish to with their choice, it gives a scope to them to hinder you from your own property by manipulating false social norms. They gather some people of their choice, form and launch themselves as a self-style social Panchayat, announcing exile to your daughter or son in the hope of hidden agendas for grabbing your property and land. So I believe that once you come to know the real root-causes behind such misdeeds like these fraud groups, hardly you will find any involvement of Khap (I can say at least for Gathwala Khap). If to say as overview then it is all about “Sada rahi sain sada rahengi jhagde ki jad teen –Jar, Joru aur Jameen” i.e. from ages and for ages there were and will always be three reasons behind or after family disputes or quarrel (sometimes behind some wars like “Troy of France” and many local epics and sagas to name), which are money, woman and land. This proverb can be different for different societies but till date not only my village but throughout India, it is male dominance so this proverb mentions “money-woman-land” else it could be “money-man-land” or just “money-land” in a society seen with equal social status for both sexes anywhere on earth? Anyway useless to say that money, marriages and land were and are still counted as individual interests until or unless caught by above mentioned fraud groups. Thus “Khap” title can’t be pledged or referred on every here and there instantly launched or bubbled personal interest groups or so called self-styled Panchayats. Khap for its followers is like a shrine of Harminder Saahib to a Sikh, Har ki Poudi to a Hindu, Jeruslam to a Yahudi, Rome to a Christian and Makka-Madina to a Muslim; also and same time these comparisons doesn’t mean that Khap is a separate religion but a unique identity group within Hindu religion like any other social fellowship under Hinduism. स्वयंभू - एक दोहरी मानसिकता: It is very important to understand that when it comes to self-styled, it should be meant self-styled only, otherwise one’s such propagation could be seen in one way or the other as a try to put all kinds of religions, entities and social beliefs worldwide as self-styled and can be questioned for every this or that including the propagator’s own social belief and identity. So self style word should be put for self rather than for census and, most importantly no religion or social belief has global, national or even state level (especially when comes to India) recognition or approval. If to talk socially then none is self-styled or otherwise all are self-styled. Further for one who has little understanding and half-baked knowledge on types of Panchayats, they should first know the real functionality and structure of each type of panchayat. To know in detail on Panchayats and its types from perspective of Nidana please read on “Panchayats & Admins” section of the website. गठवाळआ खाप के वर्तमान प्रधान is his highness dada Baljeet Singh Malik. Khap’s headquarter is at “Ulhana” village in Sonipat district and head building is “Malik House” at Gohana. A complete saga and lineage detail will soon be made available on establishment and complete history of Khap.